For every large bequest of objects and artworks donated to the museum over the years, there are hundreds of smaller donors who leave intriguing collections of personal treasures to the V&A. One such donor is the artist and writer Denton Welch. 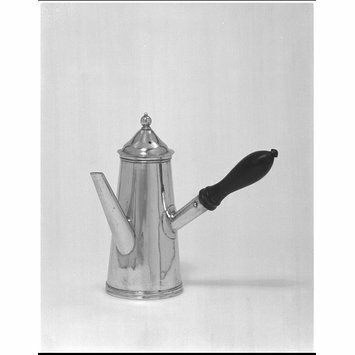 Upon his untimely death in 1948, aged 33, he left five pieces of whimsical miniature silverware ca. 1690 to 1720, and a large dolls house, ca. 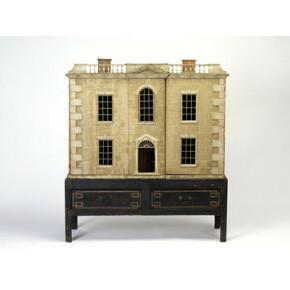 1783, which is on display in the final week of the ‘Small Stories: At Home in a Doll’s House’ exhibition at the Museum of Childhood (closing 6th September). I first discovered the writer Denton Welch through a list of recommended reads by the filmmaker John Waters, in good company alongside James Purdy and Jane Bowles. I promptly went out and purchased his first book ‘Maiden Voyage’ (1943), and from the first page of cross-dressing rebellion, I was hooked! This is the centenary year of Denton’s birth. He was born in Shanghai in 1915 to an austere Englishman with a managerial position in the international rubber trade, and a doomed American beauty who died young of illness when Denton was just 11 years old. At this time, much to his exasperation, he was sent away from China to Repton private school for boys in Derbyshire, and it is this period of his life that fuelled the inspiration for his first novel. When he escaped school for good, he went to Goldsmiths to study art with an eye to becoming a painter, but just two years later in 1935 he was run over by a motorist whilst cycling and sustained extensive injuries. After learning to walk again, he got back to managing most things but had long periods of being confined to his bed and suffered severe on-going fevers with kidney and back problems. His injuries eventually caught up with him and he passed away in December 1948. During those 13 years, full of ups and downs with his health, he wrote five books and 76 short stories, and continued to draw and paint. 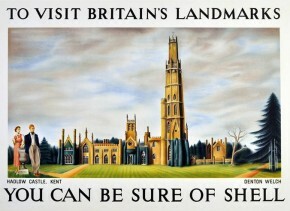 In 1937 for example, he produced this poster for Shell. 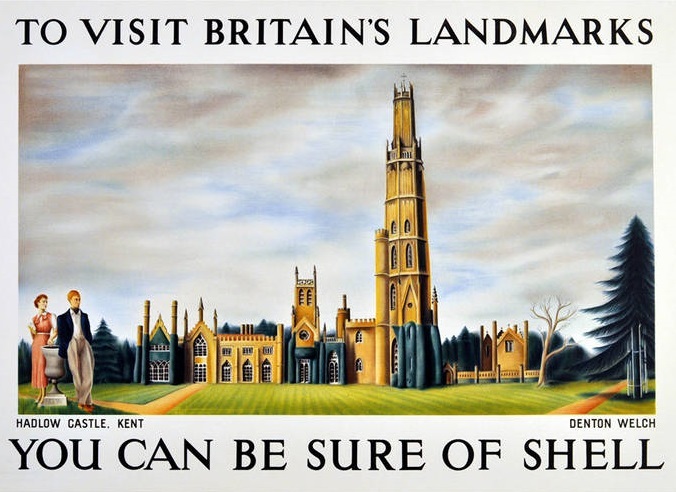 The ‘You Can be Sure of Shell’ campaign of the 1930s attracted commissions from many well-known artists of the day including Vanessa Bell, Paul Nash, John Piper, Edward Bawden and Graham Sutherland. Never one to be held back by his illness if at all possible, he would get up to all sorts of adventures, walking and bicycling around the Kentish countryside, voyeuristically seeking out strapping young men to admire from a distance. In his books, his powers of description are such that he intensely devours objects, people and places. As a queer outsider, he roamed the English countryside, visiting churches and historic houses, storing his images away so precisely that he could call upon them later with ease and bring them to life in his written work. He was an avid collector of miniature curios, small ceramics and pieces of silverware, decorative little boxes, trinkets and glassware. 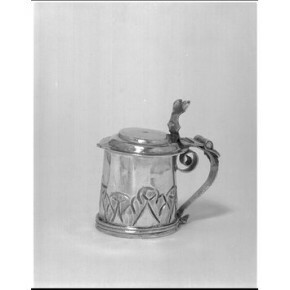 These two pieces are typical of Denton’s collections, a miniature tankard which you can read about here, and a miniature coffeepot, both on display in the Gilbert silver galleries. He had excellent taste and was a harsh critic, camply slating ugliness in both art and people’s personalities. His books are peppered with appraisals of various forms of art and design, and catty passages where he takes the whole world down a peg or two. One of the places which perfectly sums up Denton’s love for identifying changing architectural styles and alterations, and his acute delight in the whimsy and wonder of lavish, nonsensical places and things, was a grotto built in the mid-18th century at Oatlands Palace. His second novel ‘In Youth is Pleasure’ (1944) takes place at a hotel in Surrey where he reluctantly spends a summer with his father in the early 1930s. In his diaries he names the hotel as Oatlands at Weybridge. Once the site of a Tudor country house, Henry VIII took over the land to construct a monumental palace for the arrival of his new Queen, Anne of Cleves, in 1538. Their marriage was rapidly annulled so she never lived there, but Elizabeth I, James I, and Charles I all did before it was pulled down in 1650. A lodge remained on the site until a new mansion was built by the 7th Earl of Lincoln in 1716. His second son, the powerful 9th Earl, transformed the gardens of the new house and paid a small fortune to Josiah Lane of Tisbury, one of the finest grotto builders of the time, to create the largest and most lavish grotto in the whole of Europe. It is not clear from his novel or diary how much Denton knew the complete story of the grotto but I am sure he would have loved to know that the 9th Earl allegedly had a relationship with none other than Horace Walpole. The two were schooled together and went on a Grand Tour but ultimately parted company when the Earl was due to be married off. The grotto was made more famous by a subsequent resident of Oatlands, the Grand Old Duke of York, otherwise known as Frederick Augustus of Hanover (1763-1827). He moved into the property in 1790 with his new wife, Frederica Charlotte of Prussia, who adored the grotto and spent a great deal of time there. The house features in a board game ca. 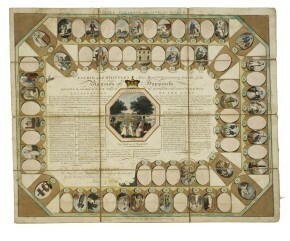 1800 at the Museum of Childhood as the ‘Mansion of Happiness’. Picturesque garden features such as cascades and grottos inspired the Romantic poets of the day, but this was a grotto like no other. Containing a games room, a bathing chamber, open fireplaces and an upstairs banqueting chamber with panoramic views over the surrounding parkland and lake, the path leading up to it was reportedly lined with teeth from slain war horses. The Duke and Duchess of York entertained Czar Alexander I and King Wilhelm III of Prussia in a lavish banquet to celebrate the defeat of Napoleon Bonaparte’s France. They dined inside the upper chamber of the grotto which illustrates just how large it indeed was! The walls were enriched with shells, ammonites, coral and feldspar crystal and the interior was decorated with Chinese furniture covered with cushions embroidered by the Duchess herself. The grotto features highly in Denton’s second novel ‘In Youth is Pleasure’, or to use Denton’s term ‘a cottage orné’. As a lonely outsider full of enthusiasm for historical curiosities, he discovers it in the gardens of the hotel and describes it having fallen into a state of extreme disrepair which saddens him. He longs to go inside to explore so boldly breaks in one night, it having been closed up as an unmaintained ‘dangerous structure’. It was precisely for this reason that in the year of Denton’s death in 1948, the grotto was demolished. He records in his diary his sadness at learning of this wanton destruction. Articles published at the time state that despite much public support for the grotto to be saved, the council were adamant that it was unsafe. Lavender Westwood wrote in ‘Country Life’, May 7th, 1948, that it was ‘slightly consoling to know that the job [of destroying it] has proved considerably longer and more expensive than anticipated’. ‘The feeling has come over me that I must let everything melt away, that I am no longer in command at all. And in my idleness all I can think of are rich strange dishes wonderfully cooked, amazing little houses in fine gardens, rare and lovely objects for these tiny palaces, and then wills and bequests both fantastic and more down to earth…’.